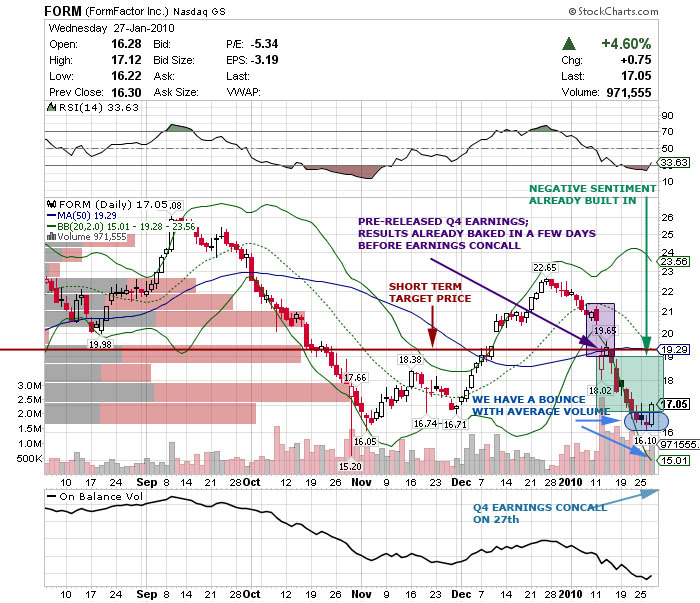 FORM is something that was on my watch list for more than a month. I was hoping that it would come down to the 50MA in the mid 19s. My wish had come true on the day it announced its preliminary 2009Q4 earnings on the 12th of January. Since then, the stock has been on a downhill until today. Today’s move nullified the last three down days. When it was in a position that nullified the last two down days, I got in: I got a small position at 16.82 with my risk defined at 16.10. I’m testing the bounce. There are a number of factors, that I think, make this a great opportunity. Customers are mobile device manufacturers; heard of the mobile device tsunami? All the negativity about the future baked in for the last week or so; what can go wrong now? I admit there are still risks such as the companies ability to meet or fulfill orders. It had a very bullish outlook in its Q3 earnings concall of which transcripts can be found here. Its inability to deliver results is definitely alarming but I think the negativity is already reflected. The price will prove my theory and on any higher lows, I’m adding more positions. Given the market’s expectation for a bounce off overall, this could go to 19.29 in a week or two. Here’s its chart to help you understand what I’m talking about.